Eggs Benedict. Little Fires Everywhere. Inside, the house was already full to overflowing. There were mimosas and an omelet station. There were caterers offering bite-sized quiches and poached eggs in puddles of velvety hollandaise. In my teenage years, I couldn’t imagine anything ever being fancier than going for brunch. As soon as I was old enough, with a purse full of money saved from my job in a fish and chip shop, I wanted to go for brunch with my school friends: Sunday mornings spent in The Coffee Club, drinking iced coffees, and ordering pastries or eggs on toast. Later, while at university, we frequented cafes, working our way through menus heavily weighted towards avocado and poached eggs. Once I arrived in London, brunch became a weekly ritual – bacon sandwiches and pots of tea at St. John in Spitalfields, bottomless chai and fried egg naan at Dishoom, English muffins, sharp cheese, and a flat white at Finks. Now 30, it’s still my favourite meal. I love its fluidity, the way that (depending on the night before) brunch can start at any time from 9am into the early afternoon. An evening meal so often ends with the bill arriving on the table, with everyone aware of work the next day or trains they need to catch. I love the way that brunch kick starts a weekend, the days stretching out ahead of us, inviting a long walk through a park, or a browse around a bookshop. Mostly though, I love bread, and butter, and eggs, more than almost any other foods. I’ll never tire of ways to put them together on a plate. When I think of the brunches I coveted in my teenage years, it was eggs Benedict that I always imagined in front of me. 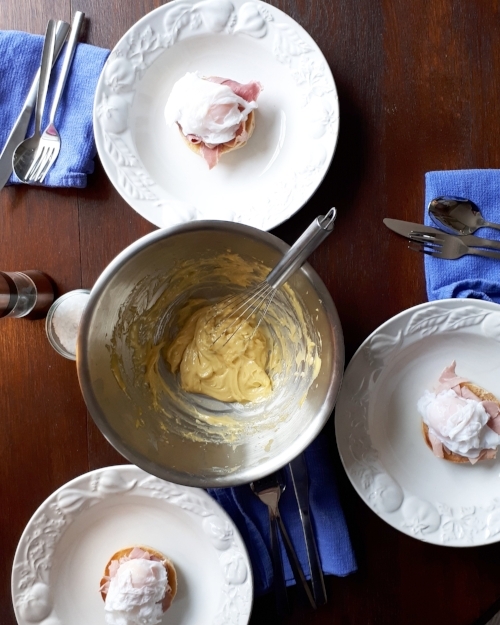 Often the most expensive dish on the menu, it was often out of reach, and, though my parents are both good at making it, I was too nervous to try hollandaise myself at home. Happily, a comprehensive read of the sauces section of Julia Child’s Mastering the Art of French Cooking in my mid-20s gave me the confidence I needed to make it work. If you’ve struggled with it, or avoided it for fear of wasting half a block of butter and your time first thing in the morning, I have some tips. Firstly, I’ve always struggled to make a small batch – a single egg yolk almost invariably ends up splitting on me. Use two. A second pair of hands (someone to add the butter on my nod) during my early attempts was useful too, but you may be less nervy than I was. The most reassuring thing I ever learnt is that if you split the sauce (it will look grainy and separated, rather than thick, if you do), you need only to start again with a new egg yolk, adding your ‘ruined’ sauce in place of the butter until you have incorporated it all. The sauce will still be rich and velvety, as if nothing had happened, and you won’t end up tipping a failed batch down the sink. I read Little Fires Everywhere over Christmas. The world Ng draws is one that, while very much American, feels familiar to me: the sort of idyllic tree-lined suburbia where there’s very little to do, and everyone seems to know everyone else. I left Brisbane, and its brilliant collection of cafes, straight after university, longing for the anonymity and opportunity of London. Next week, I’ll return for the first time in four years, and revisit all my old haunts. It’s been on my mind a lot in the past months, this planned return ‘home’, to a place I worry might no longer feel familiar. And so, in so many ways, Little Fires Everywhere felt like the perfect book to be reading – an exploration of motherhood, family, social class, and suburbia. 1. Fill your heatproof bowl with steaming hot water from the kettle, and allow it to sit for a minute, then tip the water into the small saucepan and bring it back to the boil. Dry out the bowl, which will now be lovely and warm, and tip in the egg yolks and lemon juice. Whisk until sticky and light. 2. Reduce the water in the pan to a slow simmer, and place the bowl above it, ensuring that the water does not touch the bottom of the bowl, or you risk cooking your yolks at too high a temperature. 3. Whisking continuously, add the butter to the egg yolks, a cube at a time. Only add a piece once the one before has been incorporated completely into the sauce. Keep going slowly and steadily, until you have a rich, thick sauce that holds a shape when you pull the whisk out of the bowl. Season to taste with salt and mustard. 4. Toast the muffins, butter them, and top with ham. Finally, when you’re ready to eat, poach your eggs. Bring the wide pan of water to a simmer. Crack an egg into the mug, swirl the water to create a whirlpool, lower the mug close to the water, and drop the egg in. Don’t worry if the white spreads out a bit, just nudge it back towards the centre with the spoon. Repeat with the other eggs, in batches if that makes more sense in terms of space. Once the whites are cooked but the yolks are still runny (this will take about two minutes, depending on how gently your water is simmering), remove each egg using the slotted spoon, and allow to drain a little before placing it on top of the ham. 5. Spoon some hollandaise onto each egg, and serve immediately with plenty of salt and pepper. Rice Pudding. La Belle Sauvage. She was frying some potatoes, and he was eating rice pudding. It was a busy night and he'd be needed in the bar before long. I first stood in a queue for a book in 2003. Friends of mine talked at school of camping out overnight for tickets to see their favourite band, but it was Harry Potter and the Order of the Phoenix I was desperate to get my hands on. Just as the clock struck midnight here in England, Brisbane bookshops unlocked their doors and welcomed us in – it was 9am, and we had the whole day ahead of us to read. My sister and I had travelled into town early, and stood in a line on the street, dressed in makeshift Hogwarts uniforms. It was brilliant fun (and something we repeated again for the final two Potter novels), but I was jealous of those on the other side of the world, who didn’t have to get up at 6am, and who had been playing games at parties for hours, before receiving their books at midnight. I thought, as a 30-year-old woman, that perhaps the midnight launch parties had passed me by. But last month, to my delight, I finally had an opportunity to attend one. Underneath Tottenham Court Road, I made chocolatl and spice cake for a room full of excited 20- and 30-somethings, who grew up with Lyra and Will in His Dark Materials. Seventeen years after the publication of Philip Pullman’s The Amber Spyglass, we have a brand new trilogy to enjoy. I can’t wait to devour The Book of Dust over the next couple of years. La Belle Sauvage (the first in the new trilogy) is filled with adventure and intrigue. The story takes place ten years before Lyra’s Oxford, the one we first came to know in Northern Lights. We see the world through the eyes of eleven-year-old Malcolm, clever, resourceful, and with a strong sense of what is right. Like all children in fiction who chase around the edge of - and then dive head first into - adventure, Malcolm soon discovers that security, safety, and comfort can't always be relied upon. Pullman spend the first part of the book offering us a very real sense of what Malcolm has to behind: nights in bed reading Agatha Christie (she exists in this Oxford too - or at least The Body in the Library does), trips in his boat to visit the nuns and baby Lyra in Godstow Priory, lessons in carpentry, and evenings spent helping his mum and dad. The book serves up a veritable smörgåsbord when it come to comfort food too: rhubarb tarts made by a nun, a cheese sandwich and a pale ale, mugs of steaming hot chocolatl. The steamy, noisy kitchen was the safest place in the world, it seemed to Malcolm. Safety had never been anything to think about before; it was something you took for granted, like his mother's endless, effortless, generous food, and the fact that there would always be hot plates ready to serve it on. These cold November days are perfect for it, a slow, lazy pudding, one which sits quietly in the oven for an hour or so, while you get on with some reading. Rice pudding is divisive, but as someone who never ate a claggy school dinner version, it's a dessert I've always loved. My dear friend Liv is a fan too, and it's a dish I associate strongly with her. So (with her permission), the recipe below is mostly hers. It's not a particularly pretty or photogenic dish, but I challenge anyone not to feel comforted with a big pot of it in front of them. 1. Preheat the oven to 140C. Melt half the butter over a low heat until foaming. Add the sugar and stir until dissolved, then tip in the rice, and stir until it is coated in the sugary butter. Stir in the whole bay leaves, cardamom pods, and salt. 2. Pour in the milk and cream, and stir slowly for a couple of minutes, ensuring the rice doesn’t stick to the bottom of the pan. Bring the milk to a simmer, dot the remaining butter around the top of the milk, and then transfer the pot to the oven. 3. Bake for an hour, until golden brown on top. Allow to cool for fifteen minutes, and then take the pot to the table, allowing everyone to help themselves to generous spoons full of pudding.